Liczba stron: 13286 Jest to ujednolicona liczba stron, która ułatwi Ci porównanie długości książek. Każda strona Legimi to 200 słów. 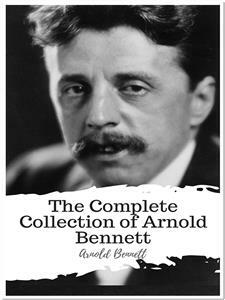 AUTHOR OF 'THE GRAND BABYLON HOTEL,' 'ANNA OF THE FIVE TOWNS,' 'LEONORA,' ETC. '"To thine own self be true, And it must follow, as the night the day, Thou canst not then be false to any man." Then young Henry burst into the room. It was exactly twelve years since he had been born, a tiny, shapeless, senseless, helpless, toothless, speechless, useless, feeble, deaf, myopic creature; and now he was a school-boy, strong, healthy, big, and clever, who could define a dodecahedron and rattle off the rivers of Europe like a house on fire. The change amounted to a miracle, and it was esteemed as such by those who had spent twelve years chiefly in watching it. One evening, in the very earliest stages, while his mother was nursing him, his father had come into the darkened chamber, and, after bending over the infant, had struck a match to ignite a cigar; and the eyes of the infant had blinked in the sudden light. 'See how he takes notice! the mother had cried in ecstatic wonderment. And from that moment she, and the other two, had never ceased to marvel, and to fear. It seemed impossible that this extraordinary fragment of humanity, which at first could not be safely ignored for a single instant night or day, should survive the multitudinous perils that surrounded it. But it did survive, and it became an intelligence. At eighteen months the intelligence could walk, sit up, and say 'Mum.' These performances were astounding. And the fact that fifty thousand other babies of eighteen months in London were similarly walking, sitting up, and saying 'Mum,' did not render these performances any the less astounding. And when, half a year later, the child could point to a letter and identify it plainly and unmistakably--'O'--the parents' cup was full. The mother admitted frankly that she had not expected this final proof of understanding. Aunt Annie and father pretended not to be surprised, but it was a pretence merely. Why, it seemed scarcely a month since the miraculous child had not even sense enough to take milk out of a spoon! And here he was identifying 'O' every time he tried, with the absolute assurance of a philologist! True, he had once or twice shrieked 'O' while putting a finger on 'Q,' but that was the fault of the printers, who had printed the tail too small. After that the miracles had followed one another so rapidly, each more amazing than the last, that the watchers had unaffectedly abandoned themselves to an attitude of permanent delighted astonishment. They lived in a world of magic. And their entire existence was based on the tacit assumption--tacit because the truth of it was so manifest--that their boy was the most prodigious boy that ever was. He went into knickerbockers. He learnt hymns. He went to school--and came back alive at the end of the first day and said he had enjoyed it! Certainly, other boys went to school. Yes, but there was something special, something indefinable, something incredible, about Henry's going to school that separated his case from all the other cases, and made it precious in its wonder. And he began to study arithmetic, geometry, geography, history, chemistry, drawing, Latin, French, mensuration, composition, physics, Scripture, and fencing. His singular brain could grapple simultaneously with these multifarious subjects. And all the time he was growing, growing, growing. More than anything else it was his growth that stupefied and confounded and enchanted his mother. His limbs were enormous to her, and the breadth of his shoulders and the altitude of his head. It puzzled her to imagine where the flesh came from. Already he was as tail as she, and up to Aunt Annie's lips, and up to his father's shoulder. She simply adored his colossal bigness. But somehow the fact that a giant was attending the Bloomsbury Middle School never leaked out. 'What's this?' Henry demanded, mystified, as he sat down to breakfast. There was a silence. 'Oh my!' Henry had lifted the basin. 'Had you forgotten it was your birthday?' Mrs. Knight asked, beaming. 'Well, I'm blest!' He had in truth forgotten that it was his birthday. 'You've been so wrapped up in this Speech Day business, haven't you?' said Aunt Annie, as if wishful to excuse him to himself for the extraordinary lapse. They all luxuriated in his surprise, his exclamations, his blushes of delight, as he fingered the presents. For several days, as Henry had made no reference to his approaching anniversary, they had guessed that he had overlooked it in the exciting preparations for Speech Day, and they had been anticipating this moment with the dreadful joy of conspirators. And now they were content. No hitch, no anticlimax had occurred. 'You must make a good breakfast, dear; you've got a big day before you,' enjoined his mother, when he had thanked them politely, and assumed the watch and chain, and opened all the blades and other pleasant devices of the penknife. 'Yes, mother,' he answered obediently. He always obeyed injunctions to eat well. But it would be unfair to Henry not to add that he was really a most obedient boy--in short, a good boy, a nice boy. The strangest thing of all in Henry's case was that, despite their united and unceasing efforts, his three relatives had quite failed to spoil him. He was too self-possessed for his years, too prone to add the fanciful charm of his ideas to no matter what conversation might be proceeding in his presence; but spoiled he was not. The Speech Day which had just dawned marked a memorable point in his career. According to his mother's private notion, it would be a demonstration, and a triumphant demonstration, that, though the mills of God grind slowly, they grind exceeding small. For until that term, of which the Speech Day was the glittering conclusion, the surpassing merits and talents of her son had escaped recognition at the Bloomsbury Middle School. He had never reached the top of a form; he had never received a prize; he had never earned pedagogic praise more generous than 'Conduct fair--progress fair.' But now, out of the whole school, he had won the prize for Good Conduct. And, as if this was not sufficiently dazzling, he had also taken to himself, for an essay on 'Streets,' the prize for English Composition. And, thirdly, he had been chosen to recite a Shaksperean piece at the ceremony of prize-giving. It was the success in Composition which tickled his father's pride, for was not this a proof of heredity? Aunt Annie flattered herself on the Good Conduct prize. Mrs. Knight exulted in everything, but principally in the prospective sight of her son at large on the platform delivering Shakspere to a hushed, attentive audience of other boys' parents. It was to be the apotheosis of Henry, was that night! 'It's a very difficult word, I'm sure,' said his mother. 'Have a bit of toast, my pet,' Mrs. Knight suggested. The door opened at the same moment. It was Cousin Tom. He was always very late for breakfast. And Tom was always being inconvenient, always producing intellectual discomfort. On this occasion there can be no doubt that if Tom had not come in just then Henry would have accepted and eaten the buttered toast, and would have enjoyed it; and his father, mother, and aunt would have enjoyed the spectacle of his bliss; and all four of them would have successfully pretended to their gullible consciences that an indiscretion had not been committed. Here it must be said that the Achilles' heel of Henry Shakspere Knight lay in his stomach. Despite his rosy cheeks and pervading robustness, despite the fact that his infancy had been almost immune from the common ailments--even measles--he certainly suffered from a form of chronic dyspepsia. Authorities differed upon the cause of the ailment. Some, such as Tom, diagnosed the case in a single word. Mr. Knight, less abrupt, ascribed the evil to Mrs. Knight's natural but too solicitous endeavours towards keeping up the strength of her crescent son. Mrs. Knight and Aunt Annie regarded it as a misfortune simply, inexplicable, unjust, and cruel. But even Mrs. Knight and Aunt Annie had perceived that there was at least an apparent connection between hot buttered toast and the recurrence of the malady. Hence, though the two women would not admit that this connection was more than a series of unfortunate coincidences, Henry had been advised to deprive himself of hot buttered toast. And here came Tom, with his characteristic inconvenience, to catch them in the very midst of their folly, and to make even Mr. Knight, that mask of stern rectitude, a guilty accessory before the fact. 'It's only this once!' Mrs. Knight protested. Henry took the piece of toast, and then, summoning for one supreme effort all the spiritual courage which he had doubtless inherited from a long line of Puritan ancestors, he nobly relinquished it. Mr. Knight's eyes indicated to Tom that a young man who was constantly half an hour late for breakfast had no moral right to preach abstinence to a growing boy, especially on his birthday. But the worst thing about Tom was that he was never under any circumstances abashed. 'As nothing is worse than hot toast cold,' Tom imperturbably remarked, 'I'll eat it at once.' And he ate the piece of toast. No one could possibly blame Tom. Nevertheless, every soul round the table did the impossible and blamed him. The atmosphere lost some of its festive quality. Tom Knight was nineteen, thin, pale, and decidedly tall; and his fair hair still curled slightly on the top of his head. In twelve years his development, too, had amounted to a miracle, or would have amounted to a miracle had there been anyone present sufficiently interested to observe and believe in it. Miracles, however, do not begin to exist until at least one person believes, and the available credence in the household had been monopolized by Tom's young cousin. The great difference between Tom and Henry was that Tom had faults, whereas Henry had none--yet Tom was the elder by seven years and ought to have known better! Mr. Knight had always seen Tom's faults, but it was only since the advent of Henry that Mrs. Knight, and particularly Aunt Annie, had begun to see them. Before Henry arrived, Tom had been Aunt Annie's darling. The excellent spinster took pains never to show that Henry had supplanted him; nevertheless, she showed it all the time. Tom's faults flourished and multiplied. There can be no question that he was idle, untruthful, and unreliable. In earliest youth he had been a merry prank; he was still a prank, but not often merry. His spirit seemed to be overcast; and the terrible fact came out gradually that he was not 'nicely disposed.' His relatives failed to understand him, and they gave him up like a puzzle. He was self-contradictory. For instance, though a shocking liar, he was lavish of truth whenever truth happened to be disconcerting and inopportune. He it was who told the forewoman of his uncle's millinery department, in front of a customer, that she had a moustache. His uncle threshed him. 'She has a moustache, anyhow!' said this Galileo when his uncle had finished. Mr. Knight wished Tom to go into the drapery, but Tom would not. Tom wanted to be an artist; he was always drawing. Mr. Knight had only heard of artists; he had never seen one. He thought Tom's desire for art was mere wayward naughtiness. However, after Tom had threatened to burn the house down if he was not allowed to go to an art-school, and had carried out his threat so far as to set fire to a bale of cotton-goods in the cellar, Mr. Knight yielded to the whim for the sake of peace and a low temperature. He expansively predicted ultimate disaster for Tom. But at the age of eighteen and a half, Tom, with his habit of inconvenience, simply fell into a post as designer to a firm of wholesale stationers. His task was to design covers for coloured boxes of fancy notepaper, and his pay was two guineas a week. The richness of the salary brought Mr. Knight to his senses; it staggered, sobered, and silenced him. Two guineas a week at eighteen and a half! It was beyond the verge of the horizons of the drapery trade. Mr. Knight had a shop-walker, aged probably thirty-eight and a half, who was receiving precisely two guineas a week, and working thirty hours a week longer than Tom. On the strength of this amazing two guineas, Tom, had he chosen, might easily have regained the long-lost esteem of his relatives. But he did not choose. He became more than ever a mystery to them, and a troubling mystery, not a mystery that one could look squarely in the face and then pass by. His ideals, if they could be called ideals, were always in collision with those of the rest of the house. Neither his aunts nor his uncle could ever be quite sure that he was not enjoying some joke which they were not enjoying. Once he had painted Aunt Annie's portrait. 'Never let me see that thing again!' she exclaimed when she beheld it complete. She deemed it an insult, and she was not alone in her opinion. 'Do you call this art?' said Mr. Knight. 'If this is art, then all I can say is I'm glad I wasn't brought up to understand art, as you call it.' Nevertheless, somehow the painting was exhibited at South Kensington in the national competition of students works, and won a medal. 'Portrait of my Aunt,' Tom had described it in the catalogue, and Aunt Annie was furious a second time. 'However,' she said, 'no one'll recognise me, that's one comfort!' Still, the medal weighed heavily; it was a gold medal. Difficult to ignore its presence in the house! Tom's crowning sin was that he was such a bad example to Henry. Henry worshipped him, and the more Tom was contemned the more Henry worshipped. 'You'll surely be very late, Tom,' Mrs. Knight ventured to remark at half-past nine. Mr. Knight had descended into the shop, and Aunt Annie also. Tom always called Henry his 'bold buccaneer.' He had picked up the term of endearment from the doctor with the black bag twelve years ago. Henry had his cap on in two seconds, and Mrs. Knight beamed at this unusual proof of kindly thought on Tom's part. In the street Tom turned westwards instead of to the City, where his daily work lay. 'Aren't you going to work to-day?' Henry asked in surprise. 'You didn't ask them,' said Henry. 'Don't rot, Tom,' Henry pleaded. The truth was that Tom was intoning a sentence from Henry's prize essay on streets. Tom had read the essay and pronounced it excellent, and till this very moment on the pavement of Oxford Street Henry had imagined Tom's verdict to be serious. He now knew that it was not serious. Henry would have given his penknife not to have written that essay. The worst of Tom was that he could make anything look silly without saying that it was silly--a trick that Henry envied. 'I didn't put "haughty,"' Henry cried passionately. And Tom actually did enter a doorway. But it proved to be the entrance to a large and magnificent confectioner's shop. Henry followed him timidly. 'A pound of marrons glacés,' Tom demanded. 'What are they?' Henry whispered up at Tom's ear. 'Taste,' said Tom, boldly taking a sample from the scales while the pound was being weighed out. 'They are rather like chestnuts, aren't they?' said Tom. The marrons glacés were arranged neatly in a beautiful box; the box was wrapped in paper of one colour, and then further wrapped in paper of another colour, and finally bound in pink ribbon. 'Golly!' murmured Henry in amaze, for Tom had put down a large silver coin in payment, and received no change. They came out, Henry carrying the parcel. 'But will they do me any harm?' the boy asked apprehensively. The two cousins had reached Hyde Park, and were lying on the grass, and Tom had invited Henry to begin the enterprise of eating his birthday present. So Henry opened the box and feasted. One half of the contents had disappeared within twenty minutes, and Tom had certainly not eaten more than two marrons. A pretty girl of eighteen or so wandered past them. 'Nice little bit of stuff, that!' Tom remarked reflectively. 'That little thing there!' Tom explained, pointing with his elbow to the girl. And he bent to his chestnuts again. By slow and still slower degrees they were reduced to one. 'Have this,' he invited Tom. 'I think I can't eat any more,' Henry sighed. Henry put the survivor to his lips, but withdrew it. And he laid it gently by the side of the watch in his waistcoat pocket. A hundred yards off the pretty girl was reading on a seat. His business led him in that direction. It was a most fortunate thing that there was cold mutton for dinner. The economic principle governing the arrangement of the menu was that the simplicity of the mutton atoned for the extravagance of the birthday pudding, while the extravagance of the birthday pudding excused the simplicity of the mutton. Had the first course been anything richer than cold mutton, Henry could not have pretended even to begin the repast. As it was, he ate a little of the lean, leaving a wasteful margin of lean round the fat, which he was not supposed to eat; he also nibbled at the potatoes, and compressed the large remnant of them into the smallest possible space on the plate; then he unobtrusively laid down his knife and fork. Henry had already pondered upon a plausible explanation of his condition. 'I'm too excited to eat,' he promptly answered. 'You aren't feeling ill, are you?' his mother asked sharply. 'I think I should like some Seigel,' said the boy. Tom was never present at the mid-day meal; only Mrs. Knight knew that Henry had been out with him; and Mrs. Knight was far too simple a soul to suspect the horrid connection between the morning ramble and this passing malaise of Henry's. As for Henry, he volunteered nothing. 'It will pass off soon,' said Aunt Annie two hours later. The time was then half-past three; the great annual ceremony of Speech Day began at half-past seven. Henry reclined on the sofa, under an antimacassar, and Mrs. Knight was bathing his excited temples with eau de Cologne. 'Of course you will, won't you, my dear?' Mrs. Knight demanded fondly of her son. The interesting and singular fact about the situation is that these three adults, upright, sincere, strictly moral, were all lying, and consciously lying. They knew that Henry's symptoms differed in no particular from those of his usual attacks, and that his usual attacks had a minimum duration of twelve hours. They knew that he was decidedly worse at half-past three than he had been at half-past two, and they could have prophesied with assurance that he would be still worse at half-past four than he was then. They knew that time would betray them. Yet they persisted in falsehood, because they were incapable of imagining the Speech Day ceremony without Henry in the midst. If any impartial friend had approached at that moment and told them that Henry would spend the evening in bed, and that they might just as well resign themselves first as last, they would have cried him down, and called him unfriendly and unfeeling, and, perhaps, in the secrecy of their hearts thrown rotten eggs at him. It proved to be the worst dyspeptic visitation that Henry had ever had. It was not a mere 'attack'--it was a revolution, beginning with slight insurrections, but culminating in universal upheaval, the overthrowing of dynasties, the establishment of committees of public safety, and a reign of terror. As a series of phenomena it was immense, variegated, and splendid, and was remembered for months afterwards. 'Surely he'll be better now!' said Mrs. Knight, agonized. But no! And so they carried Henry to bed. At six the martyr uneasily dozed. 'He may sleep a couple of hours,' Aunt Annie whispered. Not one of the three had honestly and openly withdrawn from the position that Henry would be able to go to the prize-giving. They seemed to have silently agreed to bury the futile mendacity of the earlier afternoon in everlasting forgetfulness. 'Poor little thing!' observed Mrs. Knight. His sufferings had reduced him, in her vision, to about half his ordinary size. At seven Mr. Knight put on his hat. 'Are you going out, father?' his wife asked, shocked. In pitying the misfortune of the school, thus suddenly and at so critical a moment deprived of Henry's presence and help, Mrs. Knight felt less keenly the pang of her own misfortune and that of her son. Nevertheless, it was a night sufficiently tragic in Oxford Street. Mr. Knight returned with Henry's two prizes--Self-Help and The Voyage of the 'Fox' in the Arctic Seas. The boy had wakened once, but dozed again. 'Put them on the chair where he can see them in the morning,' Aunt Annie suggested. 'Yes,' said the father, brightening. 'And I'll wind up his watch for him.... Bless us! what's he been doing to the watch? What is it, Annie? They were alone together the next morning in the sitting-room. ('I will speak to that young man privately,' Mr. Knight had said to the two women in a formidable tone.) Henry was still in bed, but awake and reading Smiles with precocious gusto. 'Pah!' Mr. Knight whiffed out. 'It's a mercy we're all still alive,' murmured Tom. Tom hastened from the room, and went down into the shop by the shop-stairs. The cashier of the establishment was opening the safe. 'That's all right, Mr. Tom,' said the cashier, smiling with suave confidence. Tom ran up to his room, passing his uncle on the way. He snatched his hat and stick, and descended rapidly into the street by the house-stairs. He chose this effective and picturesque method of departing for ever from the hearth and home of Mr. Knight. 'There's only the one slipper here,' said Aunt Annie, feeling in the embroidered slipper-bag which depended from a glittering brass nail in the recess to the right of the fireplace. And this fireplace was on the ground-floor, and not in Oxford Street. 'I'll get it,' said Aunt Annie. 'No, I'll get it,' said Mrs. Knight. So it occurred that Aunt Annie laid the left slipper (sole upwards) in front of the brisk red fire, while Mrs. Knight laid the right one. Then the servant entered the dining-room--a little simple fat thing of sixteen or so, proud of her cap and apron and her black afternoon dress. She was breathing quickly. 'Thank you, Sarah. That will do.' Aunt Annie dismissed her frigidly. The two sisters looked at each other interrogatively, disturbed, alarmed, shocked. 'Can she have been listening at doors?' Aunt Annie inquired in a whisper. Wherever the sisters happened to be, they never discussed Sarah save in a whisper. If they had been in Alaska and Sarah in Timbuctoo, they would have mentioned her name in a whisper, lest she might overhear. And, by the way, Sarah's name was not Sarah, but Susan. It had been altered in deference to a general opinion that it was not nice for a servant to bear the same name as her mistress, and, further, that such an anomaly had a tendency to subvert the social order. Aunt Annie rang the bell.